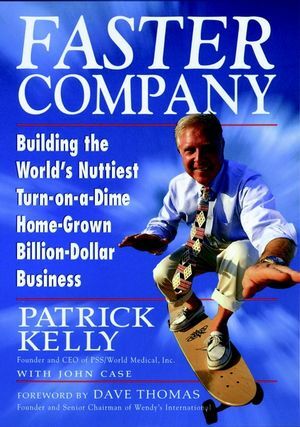 An unconventional management book by an unconventional businessman: how Patrick Kelly built a company where everybody works hard, has a great time, makes a ton of money--and leaves competitors wondering what hit them. Patrick Kelly is the founder of Physician Sales & Service (PSS), which in only 15 years has gone from a start-up company in the mundane business of distributing medical supplies to doctors' offices to the industry leader with $1 billion in revenues. Its annual growth rate is nearly 60% and today it has 3,600 employees. What's Kelly's secret? A dynamic, even nutty culture! PSS employees can fire their bosses. Truck drivers have "CEO" on their business cards. There are no policy manuals. The company's leaders--there's no such thing as a "manager" at PSS--are required to study Plato and Dostoevsky. Many have become millionaires, and despite the pressure, they love their jobs. PSS is that most unusual of organizations--a fast-track, high-growth business that's also a great place to work. Kelly himself is the ultimate success story: after growing up in an orphanage, flunking out of college, and serving in Viet Nam, he built an incredibly successful career--his way. In Faster Company, he tells you how he did it--how he built the company that has been dubbed "a cross between the U.S. Marines and Animal House." Patrick Kelly (Jacksonville, Florida) is Founder, Chairman, and CEO of Physician Sales & Service (PSS)/World Medical, Inc. It is the fastest-growing company in the history of the medical supply industry, with annual revenues for this year projected at $1 billion. Among his many awards, Kelly just received (along with Ted Turner) the Horatio Alger Award for 1997. John Case (Cambridge, MA) is editor-at-large for Inc. Magazine, and is the author of several books, including The Open-Book Experience. * National Advertising in the Wall Street Journal, The New York Times, and Harvard Business Review. * Author Column in Inc. Magazine. PATRICK KELLY is founder, Chairman, and CEO of PSS/World Medical, Inc., one of the fastest-growing companies in the history of the medical-supply industry. In 1997, Kelly received the Horatio Alger Award, an annual award given to dedicated community leaders who are committed to excellence-as exemplified by remarkable achievements accomplished through honesty, hard work, self-reliance, and perseverance. JOHN CASE is president of The Open-Book Press and an editor-at-large for Inc. magazine. A veteran reporter and analyst of the business world, he worked as a senior writer for Inc. from 1983 to 1996 during which time he wrote numerous cover stories and columns for the magazine. He is also the author of five other business books, including The Open-Book Experience. THE WORLD'S NUTTIEST BILLION-DOLLAR COMPANY. "A Cross Between the U.S.
FOUR BUILDING BLOCKS OF A FASTER COMPANY. GETTING IT DONE: ELEVEN COMMANDMENTS FOR BUILDING A FASTER COMPANY. Commandment I: Hire Great People. Commandment II: Nonstop Teaching and Learning. Commandment III: Grow Your Own Leaders. Commandment IV: Grow Your Organization. Commandment V: Open the Books (and Everything Else). Commandment VI: Commit to Performance. Commandment VII: Pour It On! Commandment VIII: Let Employees Fire the Boss. Commandment IX: Make a Lot of Millionaires. Commandment X: Out with Bureaucracy! Conclusion: The Paradoxes of the Marketplace.